Every once in a while, I’d like to profile an individual with great style. First up: the marvelous Barbara Stanwyck. Throughout her long career, she was always sophisticated and stylish, and got to wear some fantastic clothes in her films, particularly in the 1930s and ‘40s. The 1944 classic, Double Indemnity, featured Stanwyck as a femme fatale. When we see only her feet coming down the stairs, she is wearing an ankle bracelet, which caused sales of the jewelry to soar, just as Clark Gable plummeted undershirt sales when he went without one in It Happened One Night (more on that fabulous and fashionable film on another occasion!). Stanwyck’s fierce character had a wardrobe to match. Many of her clothes were tighter-fitting, and even her hair was harsher than usual – she went blonde for this film, and had curled bangs. And those fantastic sunglasses in the scene where she meets Fred MacMurray in a store! 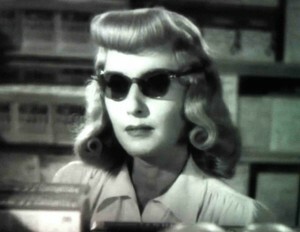 Not too many women wore sunglasses in the films of the 1940s, but they looked just right on Stanwyck in this one. 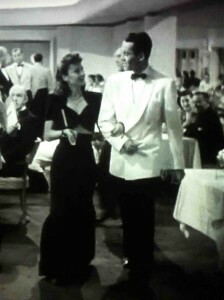 In two of my favorite Stanwyck films for fashion (interestingly both from 1941), her characters were more likable. The Lady Eve is a great sample of ‘40s style. The film is full of beautiful looks, from elegant evening wear to cute resort-style casual outfits. On the ship where her character, Jean, first meets Henry Fonda’s Hopsie, she wears a gorgeous 2-piece black evening ensemble that (modestly, of course) bares her midriff. I once read that designer Edith Head, who had a long-standing collaboration with Stanwyck in her films, often used tricks to enhance Stanwyck’s unique figure. She had a longer waist and a low backside, so Head tried to conceal that. Her two-piece gown is a prime example – the high waist of the skirt gave her a long look, but the short beaded top and bare midriff pulls attention higher. Her shoes got special attention in this scene too, as she breaks her heel when tripping Hopsie, and brings him back to her cabin so he can help her into a new pair. My other favorite is Ball of Fire, a contemporary take on the classic fairy tale Snow White. 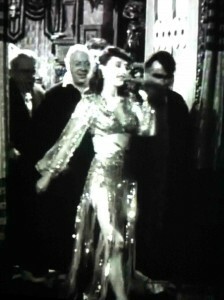 We’re first introduced to Stanwyck’s Sugarpuss O’Shea at the nightclub where she sings. She wears a stunning sequined dress that almost blinds you when it catches the lights. Again, the waistline is higher and bears her midriff, and the slits in the skirt allow her to show off her legs. She also shines in a simple, classic, light-colored day dress, which she wears while teaching the kind and sheltered older professors how to dance. I especially love her white shoes in this scene – they have the silhouette and thick heel so typical of the 1940s. Whether she was manipulating the men in her orbit or trying to outrun them, Barbara Stanwyck was always fashionable. Her characters often had an edge to them, but her clothes were usually sophisticated and beautiful. Even as an invalid confined to her bed in Sorry, Wrong Number (1948), she manages to look stylish yet vulnerable. And as the misleading Martha Stewart-type in Christmas in Connecticut (1945), she gets to wear some great long, full skirts. Turner Classic Movies is featuring Stanwyck as their Star of the Month this month, so be sure to check out some of her movies if you get the chance. *Edith Head designed the costumes for Double Indemnity, The Lady Eve, Ball of Fire, and Sorry, Wrong Number. Christmas in Connecticut featured Milo Anderson’s designs. I have been seeking a replica of the ring Barbara Stanwyck wore in the movie Double Indemnity. It is a Large Ring and I bought one on EBAY thinking it was it, but as beautiful as it was, sadly, IT WAS NOT. Please can you advise as to where I can find an exact replica of that BIG ring? Have you tried Etsy? Even if you can’t find the exact ring, sometimes some designers/sellers who do similar pieces will be willing and able to make you a custom piece… Hope that helps! Good luck!